Maybe calling it a crop is a tad misleading. But it was an experiment and a teeny bit successful. In July, I had a sweet potato on the counter that had started to grow. It was sending out long roots and just begging to be planted. So even though I’m pretty sure mid July is late to plant sweet potatoes even in New England, I used an old nursery tub and planted it in a bunch of soil that had grown ordinary potatoes some years ago. I decided not to research – for me research can prove to be the thin line between getting something done (in this case getting the unsightly sweet potato off the counter without wasting it) and spinning into paralysis by analysis and waiting another three to five years to actually do something. The vines grew in their lovely morning glory way– sweet potatoes are not a nightshade like conventional potatoes, they’re actually in the morning glory family. One of the two robust vines got chomped by some critter, so I had only one primary vine in the end. I remembered to water the pot periodically, but as there was no rain all summer, the potatoes might have been more robust if raised by a more organized person who was inclined to water daily. This is my mom. She is out every morning at six dragging the hose around her beautiful yard. Not me, I’m up at six in the morning, but I’m out with the dog and she could care less about a beautiful yard; she wants to walk. 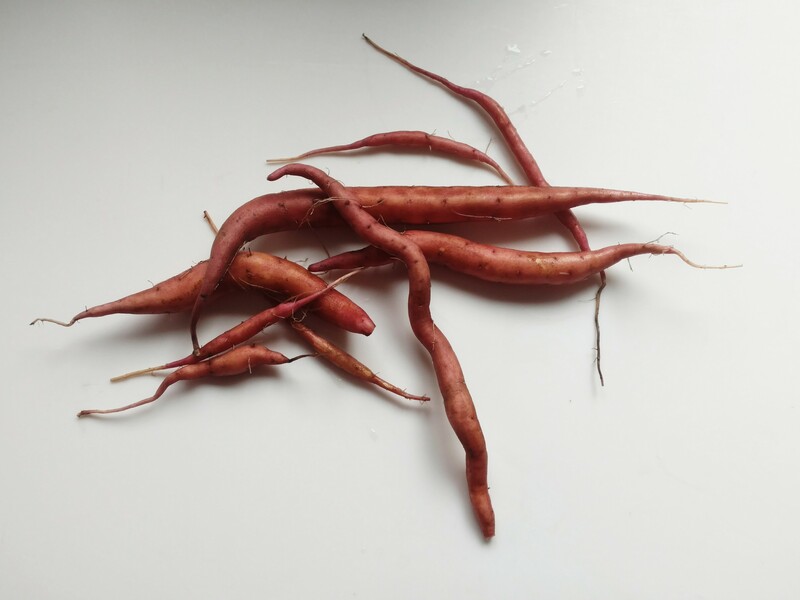 The cold mornings have come, so one day last week I fished around in the dirt under the sweet potato vines to see what I would find. I was delighted to find something, even though my potatoes are suspiciously baby carrot size. I dehydrated the little tubers just as they were. They made awesome chewy treats for the dog.